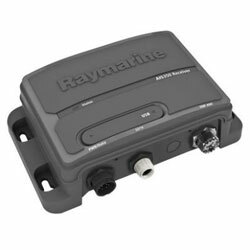 Raymarine's AIS350 Dual Channel AIS Receiver provides high-performance tracking along with easy installation. The AIS350 is a receive-only AIS unit perfect for bringing the tracking and situational awareness benefits of the AIS system to vessels of all sizes. The AIS350 replaces the AIS250. Dual-channel receiver design for fast acquisition and updating of AIS targets. Standard simultaneous SeaTalk NG , NMEA 0183 and PC USB 2.0 connectivity. Built-in NMEA 0183 multiplexer with normal and high-speed input/output.